Tom Mendoza (NetApp Vice Chairman) was fantastic in his keynote. He focused on culture and wanting to build a culture of trust & candor. CIOs understand every company is going to have issues, the question will be does the CIO of the customer trust the vendor to be there when there is a problem. Lots of talk about OnTap 8.3 – though the fact that it is RC1 and not GA is disappointing. Didn’t hear anyone reference that the 8.3 is a Release Candidate. 8.3 provides full feature parity with 7-mode. There was little discussion about 7-mode, except for how to move off 7-mode (7-mode transition tool). 7-mode transition still appears to be a large effort. For, 7MTT, the key term is “tool”. The key focus in the keynotes was “Hybrid Cloud”. One of the key takeaways is the need for data locality. The data is ‘state-ful’ as opposed to cloud computing which is ‘stateless’ — in the sense that the resource need can be metered, but data is not. So, when moving from on-prem to cloud, data would have to be replicated completely between 2. Or more so, if you are working between clouds, or maybe between clouds in different countries, the full data set has to be replicated. The concern is that government entities (Snowden effect) will require data to be housed in respective countries. This now becomes the digital equivalent of import/export laws and regulations. With the notion of different clouds, it reminds me of all the different UNIX variants. We had Solaris boxes and we had HP-UX boxes and we had DEC boxes and we struggled moving data between. Some were big endian, some little endian. So, binaries were incompatible. Finally and irreverently during Jay Kidd’s (NetApp CTO) presentation, my mind wandered when thinking about cloud computing analogies. Never noticed before how metered cloud computing is so much like washing machines at the laundry mat – pay per use. 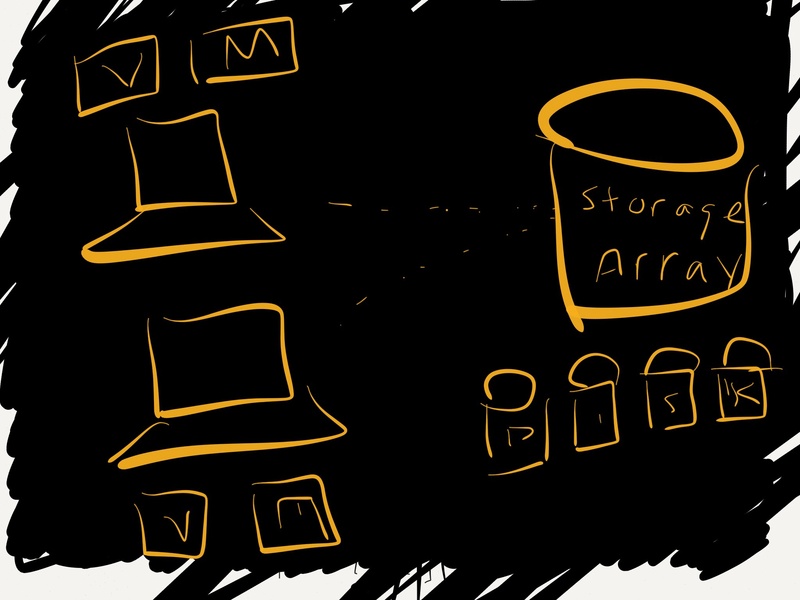 With a centralized storage array, there can be front-side limitations (outside of the array to the host or client) and back-side limitations (the actual disk in the storage array). The problem that occurs is that from the storage array point of view, the workloads at any given moment in time are random and from the array the details of the workloads are invisible. So, to alleviate load on the array has to be determined from the client side not the storage side. Each ESX host has some number of VMs and each ESX host is mounting the same export from the NetApp array. Let IA = The Storage Array’s front side IOPS load. Let hn(t) = The IOPS generated from a particular host at time t and n = number of ESX hosts. The array’s front side IOPS load at time t, equals the sum of IOPS load of each ESX host at time t.
An ESX host’s IOPS load at time t, equals the sum of the IOPS of each VM on the host at time t.
A VM’s IOPS load at time t, equals the sum of the Read IOPS & Write IOPS on that VM at time t.
The Read IOPS are composed of those well formed Reads and not well formed reads. “Well formed reads” are reads which will not incur a penalty on the back side of the storage array. “Not well formed reads” will generate anywhere between 2 and 4 additional IOs on the back side of the storage array. Let r2 = IOs which cause 1 additional IO on the back side of the array. Let r3 = IOs which cause 2 additional IOs on the back side of the array. Let r4 = IOs which cause 3 additional IOs on the back side of the array. Let r5 = IOs which cause 4 additional IOs on the back side of the array. Now for the back side IOPS (and I’m ignoring block size here which would just add a factor into the equation of array block size divided by block size). The difference is to deal with the additional IOs. Since the array cannot predetermine the values for a-i, it cannot determine the effects of an additional amount of IO. Likewise it cannot determine if the host(s) are going to be sending sequential or random IO. It will trend toward the random given n number of machines concurrently writing and the likelihood of n-1 systems being quite while 1 is sending sequential is low. Visibility into the host side behaviors from the host side is required.